Scribbled in the back of a notepad, buried deep in a closest, is The List. This is a list of rock climbs, my lifetime routes, The List of climbs so beautiful, so perfectly formed and challenging, that I simply refuse to die before I climb them. They represent a wide range: single-pitch sport and trad climbs to remote alpine walls, but what they all have in common is that for their aesthetic, athletic, and historical qualities, I find them deeply inspiring. It seems imprudent for me to advertise what’s actually on The List, partly because it does change from time to time (sometimes a new one gets added and rarely I actually mark one off), but mostly because The List is for me. It’s my guiding light in climbing, the climbing that requires me to be the climber I aspire to be and not necessarily the one I am. Thus, it feels a bit awkward to disclose the contents of The List. There are some routes that once were on The List and now, proudly, are not, routes like the Rainbow Wall in Red Rock, the Evictor and the Naked Edge in Eldo, Whatserface at the Obed, and Astroman in Yosemite. There is one route that, as of last week, might still be on The List: the West Face of the Leaning Tower. The Leaning Tower makes up for its lack of size (only a bit over 1000 feet) with its steepness. The entire wall overhangs, and the first several hundred feet are supposedly 110-degrees, not far off from the Red’s Undertow Wall. Couple its angle with the fact that one accesses the route with a 4th-class ledge traverse over 400 feet off the ground already, the Tower’s most captivating feature is its exposure. From almost any point on the route, a dropped object will fall, blown by the wind in a gentle arc, nearly a hundred feet out from the wall to the ground. A view from below the Tower. The route starts off the diagonal break and climbs up the center of the wall. 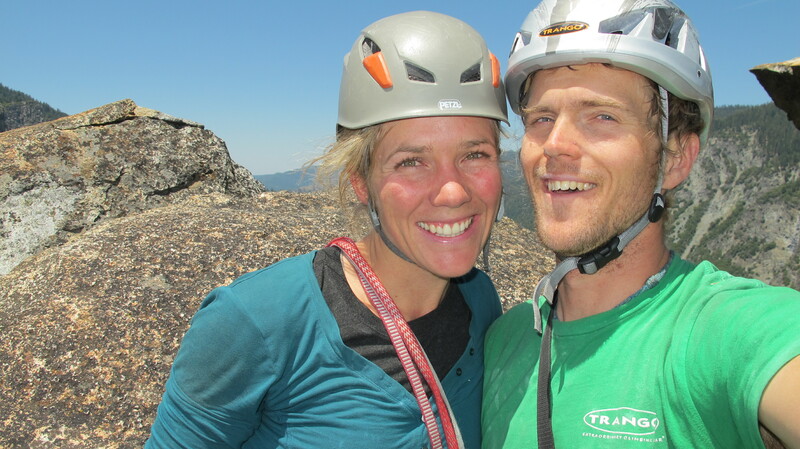 Becca and I arrived in Yosemite on May 19. Becca knew the Tower was on The List, and as an ever-supportive wife, she agreed to work on it with me in between other routes in the Valley. 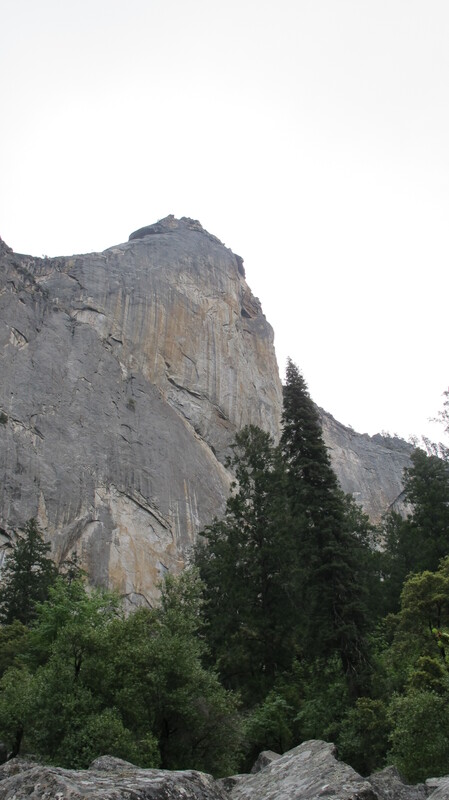 The West Face begins with 200 feet of blank, overhanging rock with a bolt ladder of over fifty bolts. Some of the best climbers in the world have tried to free climb this section, and no one has even come close. So, a free ascent of the West Face begins with aid climbing. For the first day, our plan was simply to check out the first four pitches, the two up the blank bolt ladder and then the first two free climbing pitches, which also happened to be the two hardest pitches of the route. 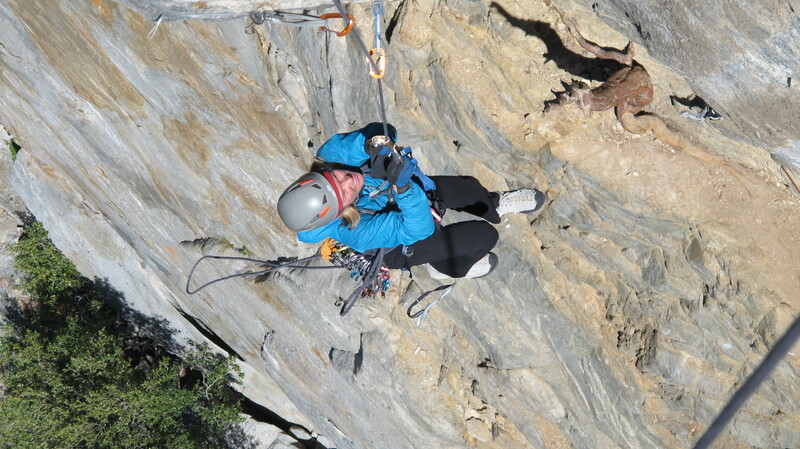 When Becca I and arrived at the base, two guys just started to ascend their fixed line to the first belay. Between waiting for the guys ahead of us and our own ineptitude in aid climbing, we only did pitches 1 and 2, but we did manage to fix a line on the bolt ladders to make it easier to get to the free climbing for future attempts. We spent the day un-confuffling ourselves from nets of daisy chains and etriers when we weren’t belly-breathing to keep breakfast down as we spun in the dizzying exposure of the wall. On the bright side, Becca and I had a lot of fun since we got to struggle through this new challenge (aid climbing) together. Wondering what the heck I’m doing in aiders. Becca on her first jug, ever. A few big days in the Valley left us feeling worked and our hands thoroughly bruised, and so we decided on a lower commitment jaunt up through the crux of the West Face. We reasoned that we’d trade exhausting cracks and epic descents for steep jugging and crimpy face climbing. Our fixed line made the first two pitches much easier and even provided a descent warm up for the difficult climbing on pitches 3 and 4. I French-freed pitch 3 (5.12), doing many of the free moves but skipping some sequences to get up the pitch efficiently, and Becca followed with a few hangs. On pitch 4 (the route’s crux at 12+/13-), I made a commendable onsight attempt before working out all the moves in a few tries. I rapped back to Becca, and we descended down our lines to the ledge and ground. Overall, I was psyched. 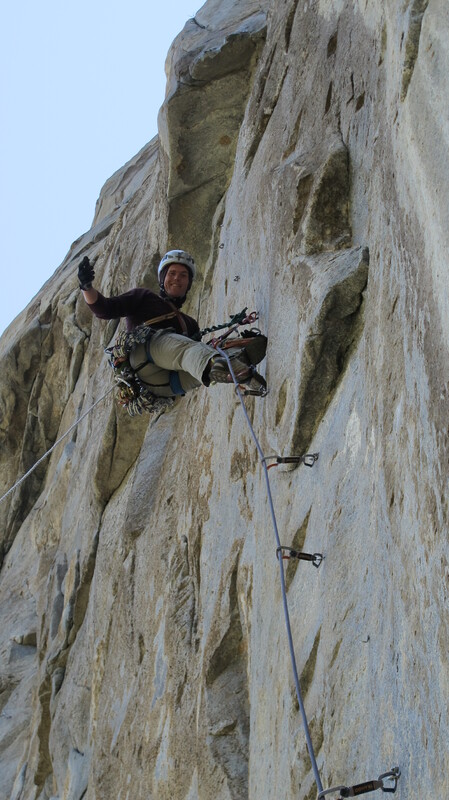 The West Face was the hardest multi-pitch route I’d ever tried – it was on The List. And the crux felt very doable. I persuaded Becca that we should just go for it. I felt like I might be able to send pitches 3 and 4 first go and then try to onsight the rest of the route (5 pitches of 5.11 and 5.12). We knew the weather was still cool and it was mid-week. It seemed like we wouldn’t have a better shot. We got the base early and jugged to the bottom of pitch 3 with what could almost be considered competence. My toes were burning as I fumbled through the sequences that I didn’t practice on my first try days before. Fortunately, I managed to grab the finishing jug as my feet popped off the miserable smears, and I romped up to the belay. I took a fall at a tricky mantle in the middle of pitch 4, then lowered, pulled my rope, and sent the pitch with confidence. I then onsighted the next 5.12 traverse and aided up the second bolt ladder. The weather was crisp and pleasant, and I was feeling great. I was sending. And then things started coming undone. Up until that point, Becca could follow pitches by pulling on gear when the climbing got too hard, but on the traverse, a fall sent her spinning across the wall. The spins, the hard climbing, the brutal curve of nothing but space down the wall to the ground hundreds of feet below pulled too heavy on her spirits. This wasn’t her project; it wasn’t on her list. I know what it says about me that I agreed (actually, I basically insisted because I could see how miserable it was for her) to go down. I could rationalize about how the climbing, especially with all the bolt ladders, hanging belays, and trick maneuvers, wasn’t as perfectly aesthetic as I thought it would be. I could even go as far as to say how, since I’d already sent the hardest climbing, it was only a formality to climb to the top. But the reality is that my partner, my wife, didn’t want to be there and wasn’t climbing this wall for herself, and I didn’t want to put her through that just to cross this route off The List. We rapped and pulled our fixed line, moving on to other climbs. The West Face seemed to haunt Becca. We decided we wanted to climb a big wall, and the familiarity of the West Face tempted us up there again. By now though, it was hot and free climbing in the sun would be nearly impossible. Instead, we planned to climb it in two days, spending the night on the comfy Ahwanhee Ledge, thus allowing us to climb in the shade both days. Becca led the first bolt ladders quickly, and I jugged. The muscle memory was building, offering confidence. Pitch 3 felt great; I stemmed and smeared through each crux with confidence. I again slipped off the mantle of pitch 4 and, in a mess of chalk dust and desperate gasps, sent it second try. By then, we were at the bivy ledge and in the sun, so we set up a tarp as a sunshade and lounged through the afternoon sun listening to podcasts on our iPhone. At sunset, I led the traverse and bolt ladder by headlamp (Disclaimer: There is a 40-foot 5.12- variation around the bolt ladder that, due to its very large loose flakes, I decided not to climb.) and fixed the line. I woke up tired. It had been over a week since I’d actually taken a real rest day, and the previous day’s climbing, hauling, and hours in the sun had drained me more than I expected. Still, we continued up. The next pitch was a greasy 5.11+ crack. Between my fatigue and the humidity, I wasn’t relaxed and climbing efficiently. I sent the pitch, barely, the first crack in my veneer of confidence. Following the 11+ crack pitch. 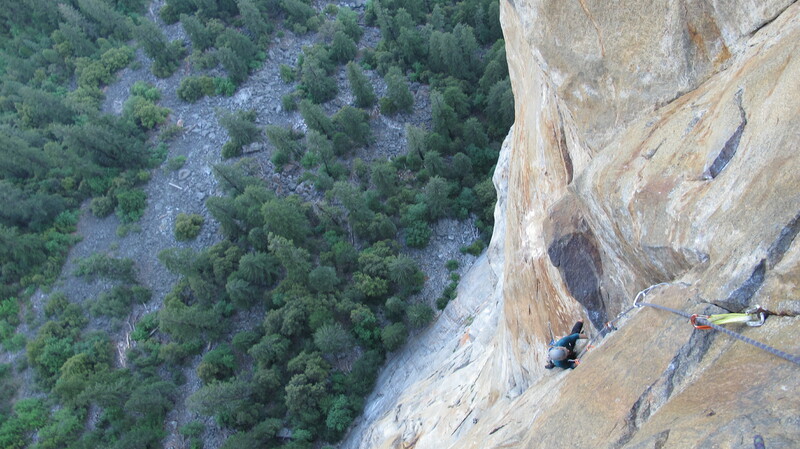 The next pitch (5.12) was intimidating – a pumpy undercling out a large roof. I managed to climb through the first hard sections, constantly battling back the pump. The rock felt wet, my hands seeming to slowly slide off of holds. As I deadpointed up into the roof, I had a lot of doubt. Still, I continued battling out the undercling. At the lip of the roof, I got to what, under normal circumstances, would have been a decent rest, but I was gassed. My breathing was out of control, forearms wasted. In my haste out the roof, I had blindly clipped a few fixed wires and had no idea how good they were. I moved up into the corner above a few times but each time balked at the slippery lieback. Finally, I lost it, watched my perfect send slip out of my weakened fingers, and sank onto the rope. I pulled back on and quickly found the sinker finger lock, just a few feet above my head, that was the key to pulling into the corner. Damn it. Damn it. Damn it. Damn it. 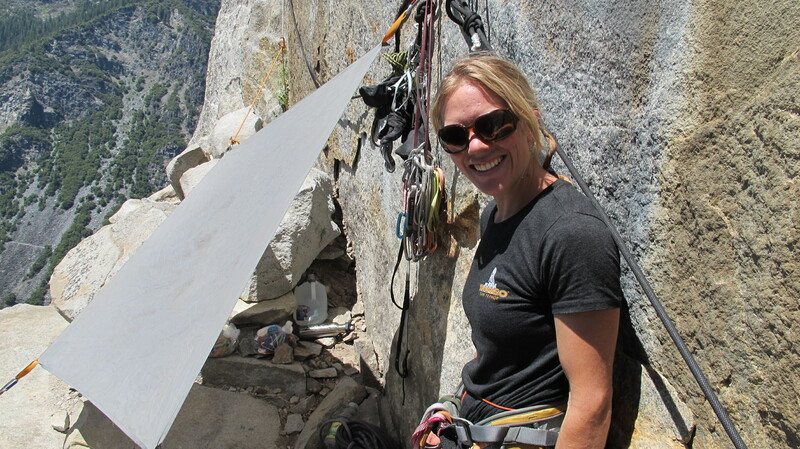 I was still tired and laid down on the ledge below the last pitch as Becca jugged the roof. Had I not fallen, maybe I would have been able to rekindle the fire for the last rope length. But no amount of energy bars and caffeine could fix the problem. 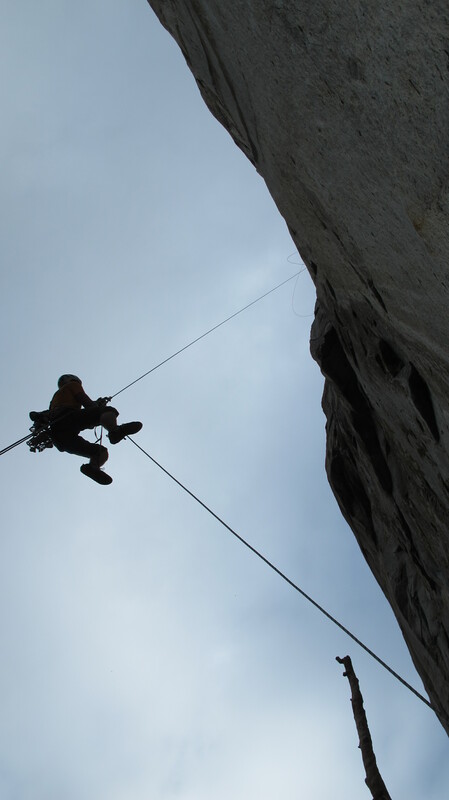 I started up the final pitch, a technical stemming corner at 5.12-, with trepidation. Each time it seemed to get hard, I found a foothold or finger lock that allowed a move higher. But I was waiting for it to get too hard, waiting for my body to give up. High in the corner, the crack narrowed, and the footholds disappeared. I stood up on a slippery smear and reached my fingers into a flared lock. Nothing felt like it would hold, yet I was still on the rock. I got impatient, and carelessly pasted my left foot on the wall, not looking for the good edge inches away. I saw where the crack opened, where it got easy, where I could relax, but as I reached there, my foot popped, sending me back on the rope a second time. Damn it. Still, we climbed to the top of the wall and celebrated on the summit. As a big wall for us novice big-wallers, it was a proud ascent, and truth be told, I nearly free climbed the damn thing. If I went back up there, I’m pretty sure I would send those pitches. I think if we’d had better conditions or more time or whatever, I would have sent. Maybe I should have convinced Becca to keep climbing earlier, but then my ascent would have been tainted by the stain it left on my marriage. So who knows? I did the best I could in the moment. It wasn’t perfect, but it was close.